This post originally appeared on flyteboard, flytedesk’s community for student journalists. In fact, these were three goals cited by each of the four students I interviewed who have run their own “Humans of…” projects. If you’re interested in harnessing these goals for your own student paper, yearbook, or blog, then prepare to be inspired. Here’s how four college “Humans” page runners have worked with student media to make their “Humans” community alive and thriving. Jeremy Berkowitz never worked on the staff of The Daily Targum. He started Humans of Rutgers University (HORU) at the end of his freshman year, undecided in major and lacking a camera. By the end of his senior year, his page had reached over 11K followers and he discovered a passion for photojournalism. HORU steadily gained enough popularity to attract the attention of The Targum’s reporters for a story. In early 2016, Berkowitz profiled members of The Daily Targum’s staff during the week of an administrative referendum to remove all or part of the paper’s funding. Soon after, The Targum reached out to see if he’d be interested in letting them host his project in a tab on their website. The partnership became official that September. Berkowitz retained his independence and was never technically part of the paper’s staff. Now that he’s graduated, The Daily Targum will adopt and continue the project under their staff umbrella. Berkowitz put together a guide detailing his method so that there is as much continuity as possible. “No more red tape… now it can flourish in a journalistic setting,” he said. The Facebook page is heavily modeled after Humans of NY (HONY): anonymous, paragraph-long quotes paired with a nameless face. His goal and hope for the page has been “finding unity in diversity to help the community:” bringing people together on the diverse Rutgers campus. One of the greatest successes he’s seen is the “sheer number” of community members who appreciated and followed the page. Berkowitz believes the format is adaptable. As Student Life Editor at The Equinox, Emma Hamilton oversees the weekly “Humans of KSC ” feature in their print copy and on their website. Like HONY, the faces in those photos are never named, a fun component which Hamilton says “breaks up the traditional news parts of it.” While readers featured in The Equinox might be turned off by lengthy interviews or negative coverage, Humans of KSC lets students participate stress free. 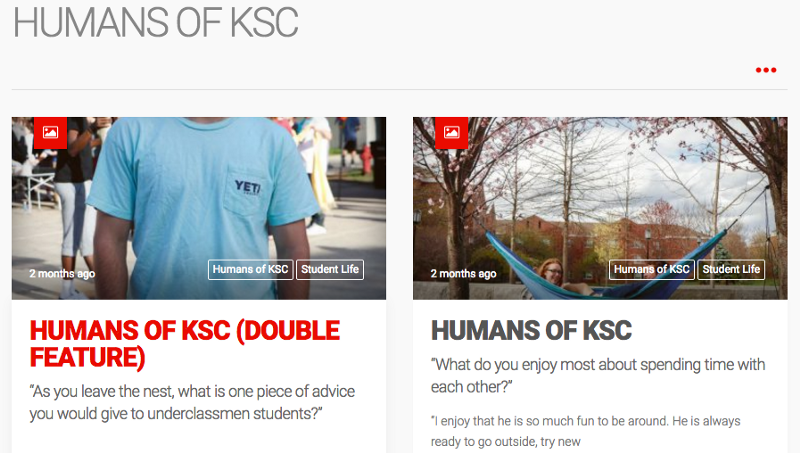 Students at KSC can view Humans of KSC in a quarter-page of the print copy and on their website. Hamilton would like to see any social media outreach function as a traffic driver back to print and digital outlets. Mikayla Shoup is a Features section writer at The Lumberjack, where several writers rotate to write a weekly “Humans of NAU” article featuring between four or five humans. The Humans series has been ongoing for about a year and isn’t the only Features section series; its sibling is “Insights into the Past,” which spotlights events that day in history. The theme of each “Humans of NAU” article coincides with the theme of the paper that week. The final 2016–17 post for the graduation issue featured solely seniors. Unlike HONY, more robust information about the interview subjects is given with each photo, including their name and year/position. Humans of NAU posts on Facebook generally perform better compared to other content posts. Shoup attributes this to the “human interest” element and the diversity. In Louisiana State’s student media, “Humans of LSU” is under the umbrella of the yearbook, Gumbo. The feature started in 2014 with two Gumbo staffers who have since graduated. 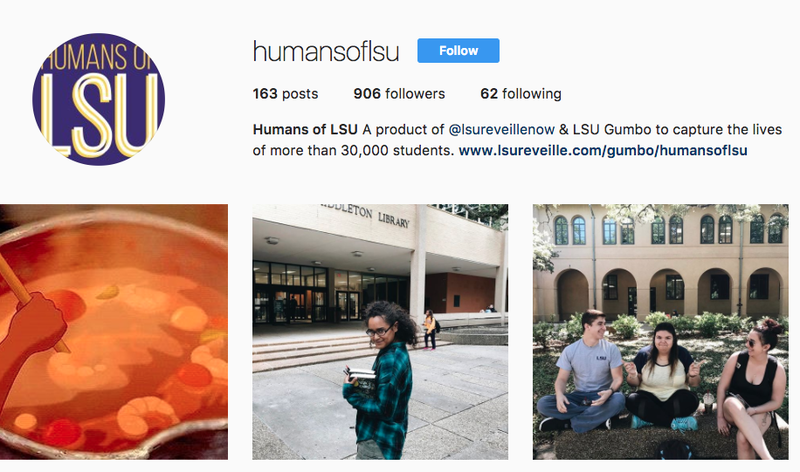 Humans of LSU is now a regularly-updated feature that goes out on Facebook and Instagram throughout the year and is compiled in a “Best Of Humans” section in the physical copy of the yearbook. Because the page is relatively new, reporters are still free to make of it what they like. Marlie Lynch and Taylor Gonsoulin, Gumbo co-editors, hire two Humans reporters and pay them per post. They’ve been hiring younger editors to ensure the continuity and nurturance of the page. “It’s still like a baby, and we’re still trying to find the best way to raise it,” said Gonsoulin. For the print copy, one hope is to incorporate layered videos with Aurasma, where app holders scan a photo with their phone and watch a live video message play. The page has already seen a 300–400 percent increase in followers on Instagram and Facebook in the last two years. Their goal is to have one post per day in 2017–18. Lynch says getting the word out is a matter of organic networking. “The more you post, the more people know people,” Lynch said.